THE BEACH BOYS Nov. 27, 1968 BOSTON CONCERT POSTER. 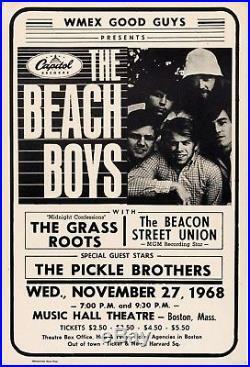 11.5×17 thin cardboard poster for Nov. 27, 1968 concert that took place at the Music Hall Theatre in Boston, MA that features The Beach Boys, The Grass Roots, The Beacon Street Union and The Pickle Brothers. Poster was printed by Metropolitan Show Print and features photo of The Beach Boys w/”Capitol Records” logo at left. Even aging and some scattered corner tip wear. Some faint moisture staining along upper right margin but this is not noticeable on front. The item “THE BEACH BOYS (1968) BOSTON CONCERT POSTER Original Scarce” is in sale since Thursday, September 6, 2018. This item is in the category “Entertainment Memorabilia\Music Memorabilia\Rock & Pop\Artists B\Beach Boys”. The seller is “thejudge01″ and is located in Port Coquitlam, British Columbia. This item can be shipped to United States, Canada.